L.A. Design Concepts provides Consumer & Designer access to over 500 exclusive “trade only” lines of furniture, textiles, lighting and wallcoverings. Our website is tailored for today’s consumer who elects to make their own design decisions. We also facilitate orders for designers who do not have trade accounts established and would like to order for their projects. Our price structure is the same for consumers or designers. Our design staff will process your order to the exact specifications required and coordinate freight and “White Glove” delivery to your residence. L.A. Design Concepts has been bringing designer furnishings into homes since 1987. Search our Shop by Category list. Shop manufacturers websites through our Shop by Manufacturer links. Peruse our “Hot Picks” section featuring some of our most popular designs offered today. 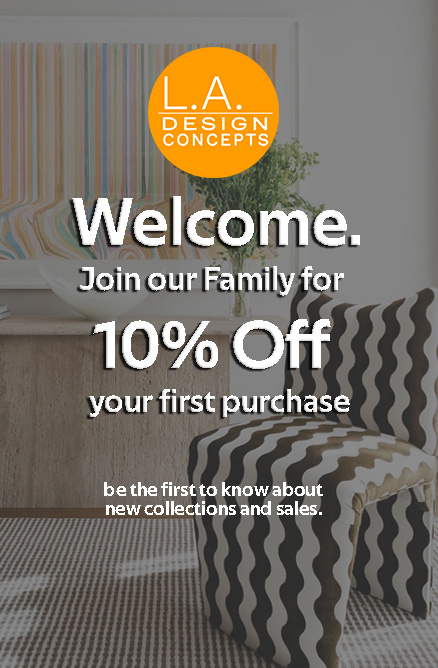 Shop your local design center through our Letter of Introduction.